...for your little princess or prince! This castle birthday cake makes a perfect cake for a princess themed birthday party or change the frosting colors and make one for your little prince! 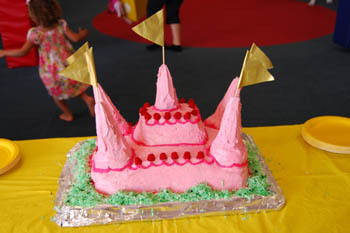 Using just two different sized cake pans, four cupcakes and five ice cream cones you'll create an amazing 3D castle cake like a pro! Any cake recipe will work for this one, in fact, you can use different flavors for the different parts! For example, if it is for baby's first birthday and you are still avoiding chocolate, make the top layer or the cupcakes "baby friendly" and do the rest in chocolate for the adults. Once you break down the cake into parts like the diagram shows you'll realize that it really is pretty simple! Bake your two layers and a batch of cupcakes and let cool completely. Once cool, place the small layer on top of the larger one and cover with frosting. Next, arrange your four cupcakes upside down on each corner (be sure to remove the paper shells if you use those!) and carefully press the ice cream cones into the cupcakes then cover with frosting. The frosting acts as a glue for all the parts. You can easily create pennant flags like the ones shown out of long toothpick skewers and a bit of colored paper. Just fold the paper over and use a few dots of glue. The trim can be piped on and you can easily make a piping bag by cutting a tiny corner off from a ziplock bag and squeezing your frosting through it. Raspberries or gumdrops make excellent add-ons too! You'll likely have some extra cupcakes, so don't forget to decorate those too in case you run out of cake. 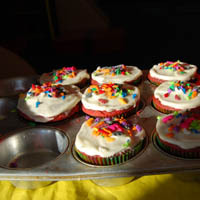 Cupcakes are perfect for having on hand at birthday parties because kids often have to leave before the cake is served so they can take one to go. Plus, there is always room for more cake. This fantastic cake was made by my wonderfully talented friend, Wendy...who is working on building her own website that I'll link to soon! 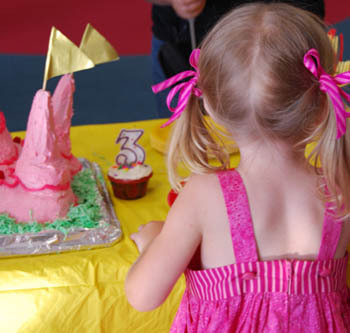 Enjoy creating a castle birthday cake masterpiece & happy birthday to your little one! Go to the Homemade Birthday Cakes Section for more project ideas! Back to the top of the Castle Birthday Cake page.